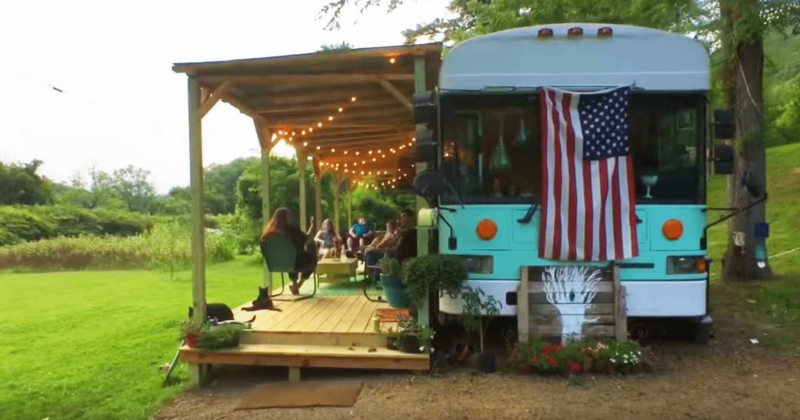 The Jamesons, a family of five from Florida, decided that they wanted to live a simpler, carefree life off the grid. 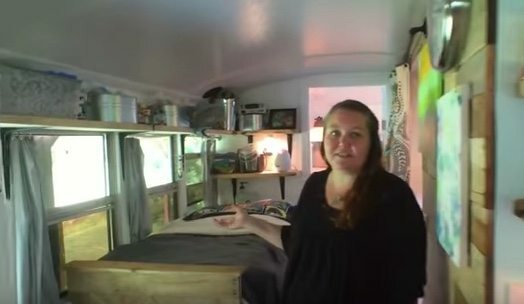 So, they sold their home, bought an old school bus, and converted it into an eco-friendly home on wheels. 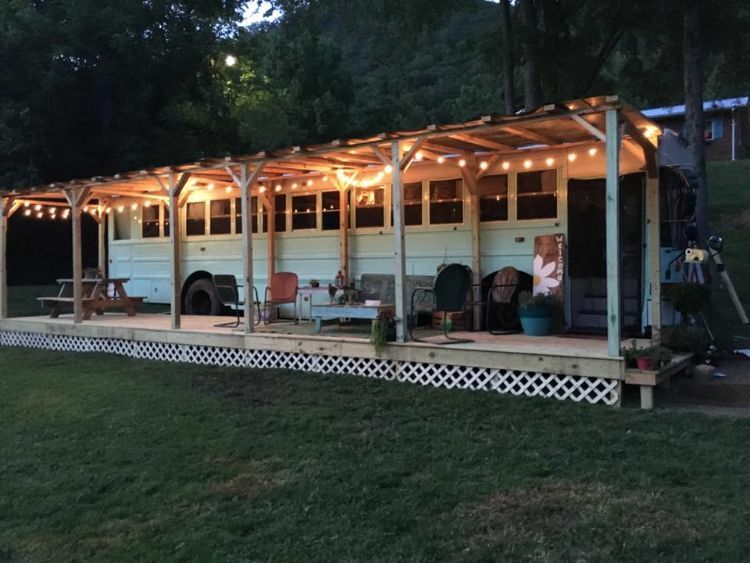 Now, it sits on a homestead in Hot Springs, North Carolina, and the family couldn’t be happier. 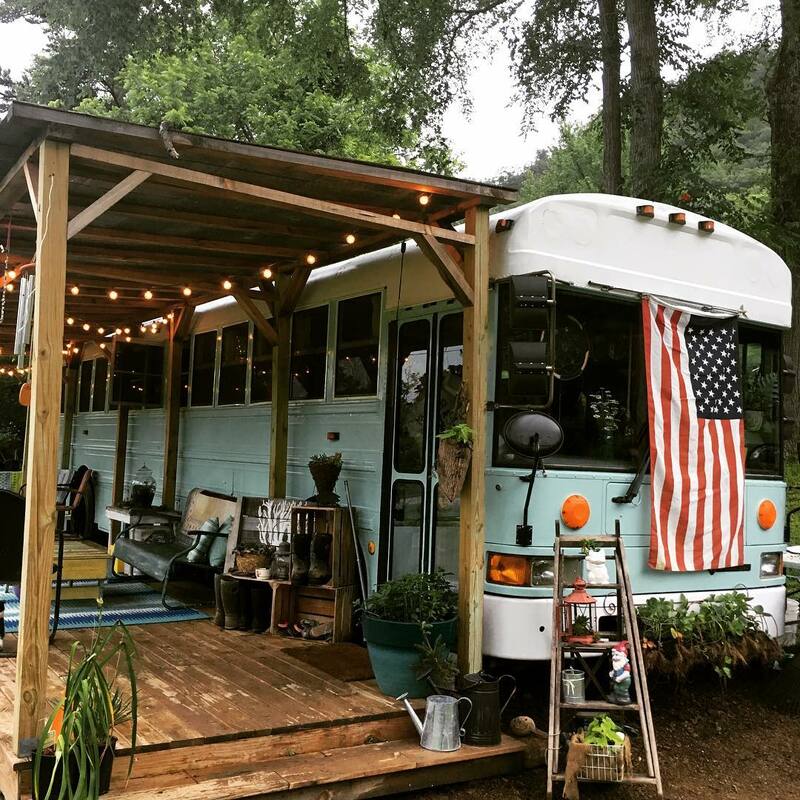 The Jamesons’ home, lovingly dubbed the Blue Ridge Mountain Bus, has more than enough room for the five of them. 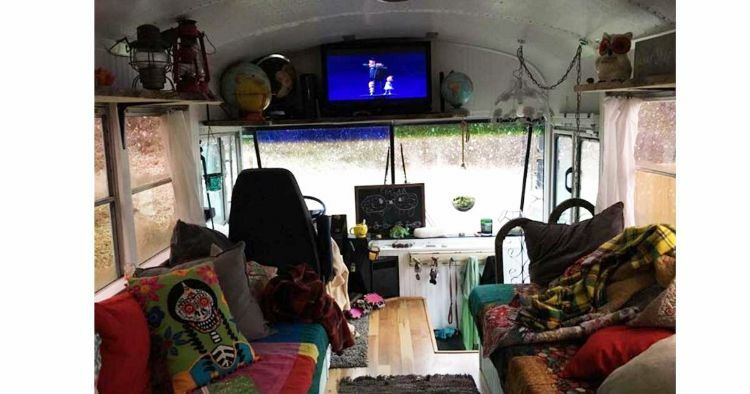 The fully equipped bus-turned-home has everything the Jamesons need. There is a kitchen, living room, bedroom, and bathroom, as well as an expansive wood deck, which provides a perfect place for the family to relax during sunny days and warm nights. The living room is colorful, cozy, and welcoming. Just past the driver’s seat of the bus is the family’s lounge area that also serves as the bedroom for two of their three children. The bright and colorful sofas double as twin beds and there is also storage underneath for extra pillows, blankets, and clothing. 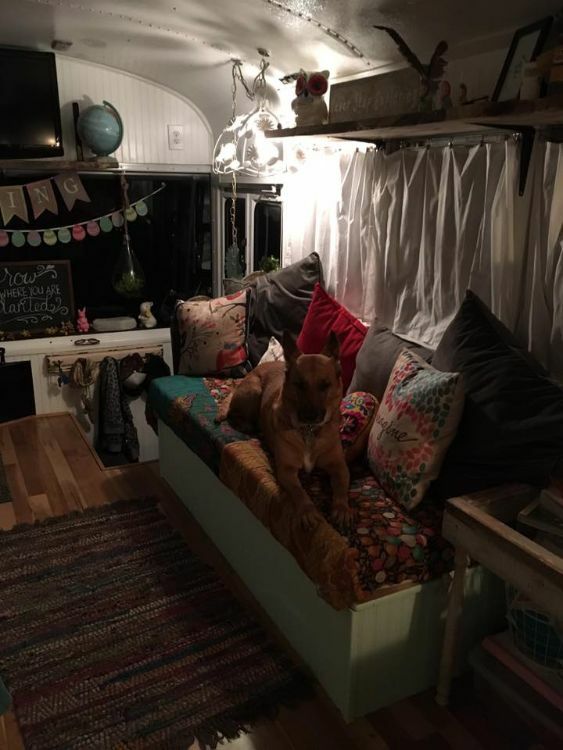 Wood flooring and adorable pieces of decor truly make the bus feel like a home. Exposed shelving provides a place for books and knick-knacks, while a fun pendant lamp provides light for the room – the entire home is powered by solar energy. Banners and a chalkboard add a bit of a ‘farmhouse’ touch to the room. 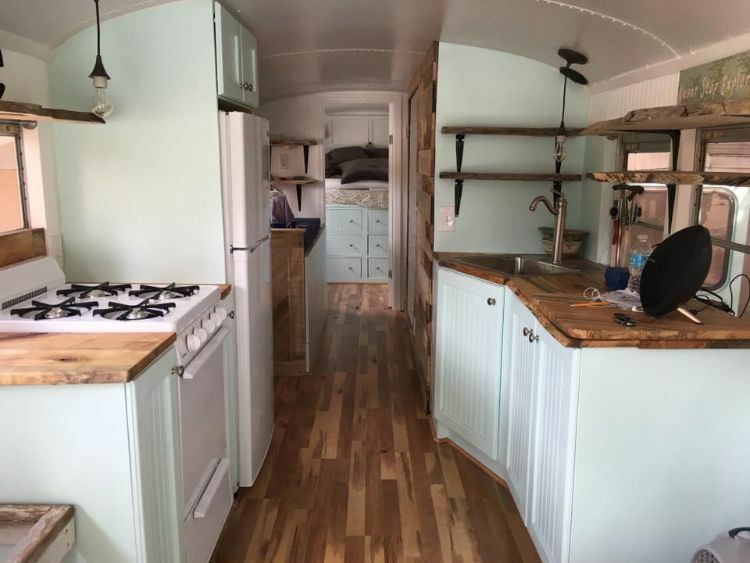 The handcrafted kitchen is by far one of the most impressive rooms in their school bus home. The gorgeous kitchen is sleek, elegant, with hints of rustic elements. There is a full-sized oven and stove, as well as a full-size refrigerator. On the opposite side, wood countertops lead to the small sink with chic and refined hardware. 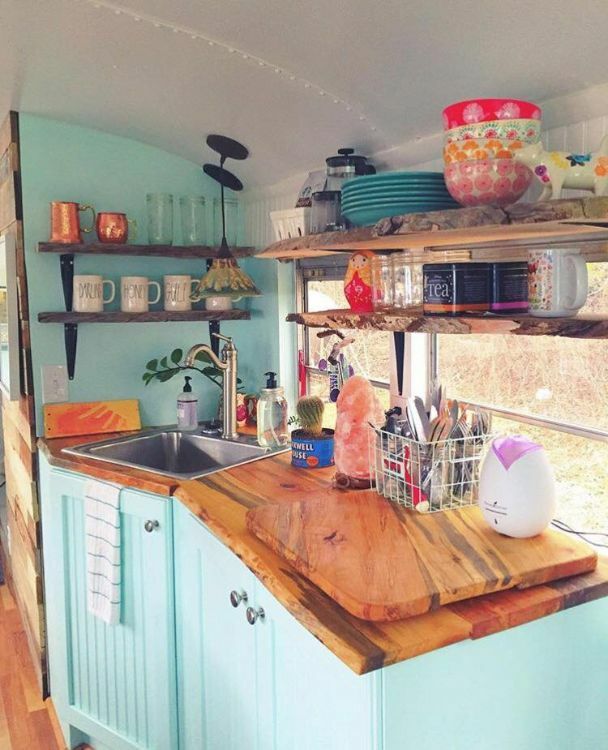 The Jamesons opted to decorate their kitchen with bright, vibrant colors and unfinished wood shelving for storage. The wood looks absolutely beautiful against the seafoam green cabinets. Head down the wood-paneled hallway to reach another bed and sleeping space. Another small ‘bedroom’ area in the hallway serves as the sleeping area for the couple’s third child who has cerebral palsy. Windows line the space providing lots of natural light, and there are exposed shelves for storage. 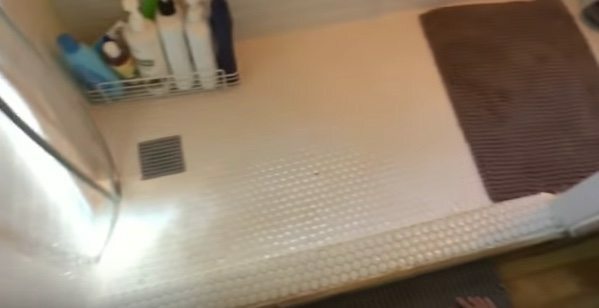 Across the hall is the family’s bathroom. 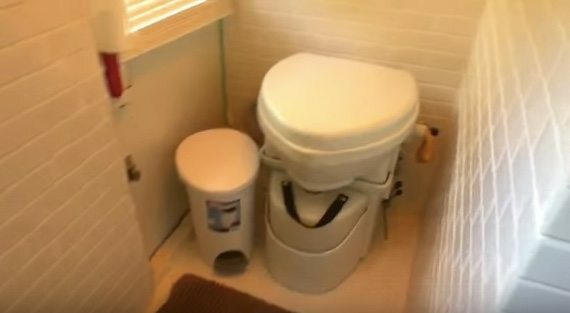 The Jamesons wanted to have a planet-friendly bathroom so they opted for a composting toilet. The room has faux subway tile walls and a handicap friendly stand-up shower. 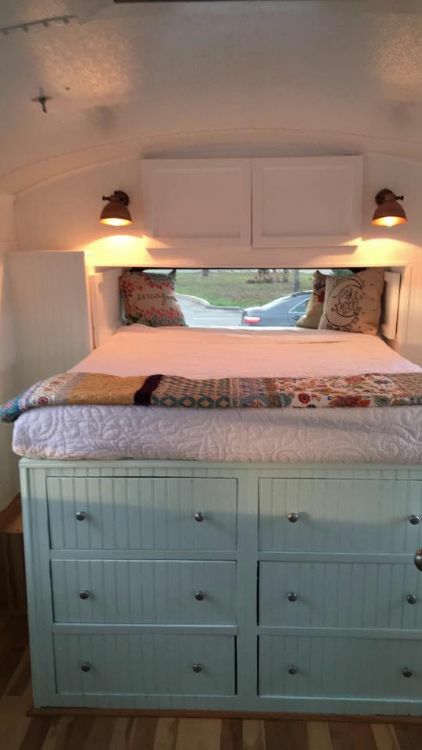 The couples’ queen-size bed is on a raised platform which not only provides lots of storage for clothing, linens, and bedding, but it also accommodates the bus’s rear engine. There are also built-in cabinets next to and above the bed for even more storage. Windows surround the space for lots of natural light. Another highlight of the school bus home is the large covered patio with pretty stringed lights. The Jamesons have nearly double the living space when you include this expansive wood deck. There is enough room for a picnic table for dining al fresco, as well as a lounge area for enjoying a morning cup of coffee or a board game with the kids. The family’s neighbor and dear friend, Beryl, behind Wild Roots Homestead made a wonderful walk-through video tour of the home below.